We have had many conversations in the community, and here are some of the questions and comments that we have heard so far. These questions and comments, along with the specifics of each conversation and other community data, will be addressed in our recommendation to the Tribal Council. 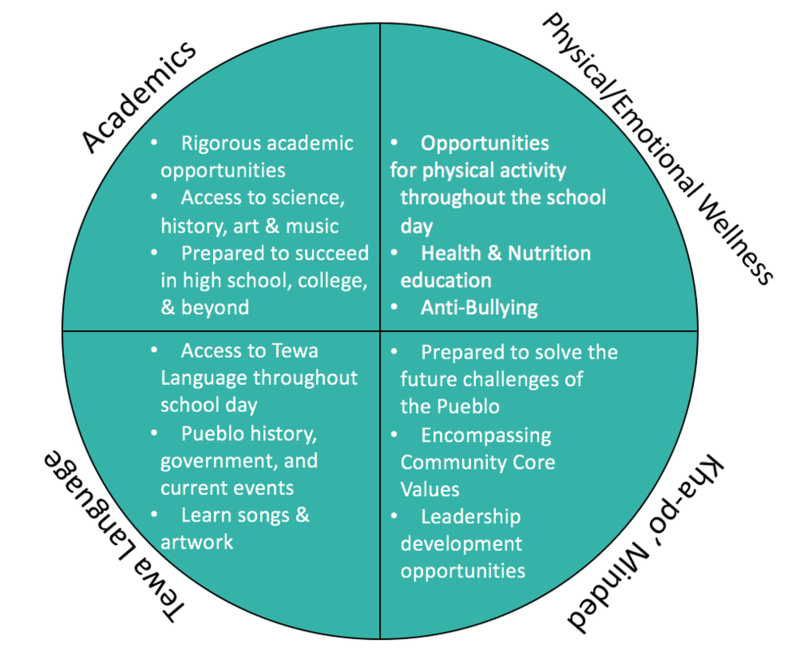 Below is an image representing the four major themes we've heard echoed in the community as focus areas for education in the Pueblo: Academics, Physical/Emotional Wellness, Tewa Language, and Kha-p'o Minded youth. Each theme includes a few key points that community members, parents, and students have shared with us. In August, Dr. Gregory Cajete met with a small group of community members to discuss the community vision for education. This process continued in a wider forum at the Education Symposium on Oct. 12, 2015. Here is the most up to date document with the insights for the vision of Santa Clara Pueblo education. Language and culture are important, and should be a foundation of the school day. Santa Clara children need to use activities to help them learn. Santa Clara children need to be prepared to become community and Tribal leaders in the future. The children of the Pueblo need more physical activity built into the school day. Our children need to be prepared academically to have secondary and post-secondary success. Teachers need more freedom to create lessons. The community needs a voice in the school. The community and the school need to have strict lines separating them. The bureaucracy of the BIE makes getting resources for the classroom difficult. Other subjects, such as science, history, music, art, and wellness are critical to the education of Pueblo children. Students are going to have to be proficient with technology to succeed in the 21st Century.